The Shoprider Sovereign 4 is designated as a Class 2 pavement scooter, which means it has a top speed of 4 mph and may be driven on walkways but cannot be legally driven on roadways. It does not have to be registered or insured, and the operator does not have to be a licensed driver. Portability: The Shoprider Sovereign 4 is not classed as a travel/portable mobility scooter, but it can be easily disassembled for transport or storage. Its heaviest component weighs 25 kgs. 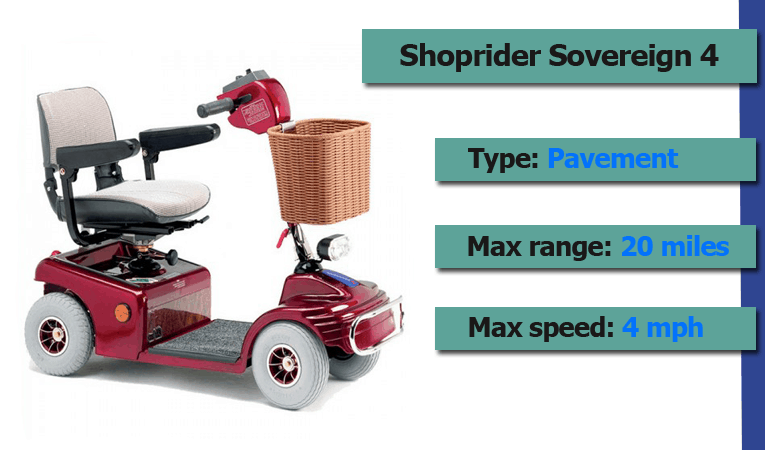 If you’re looking for quality, comfort, and dependability at an affordable price, the Shoprider Sovereign 4 pavement class mobility scooter fits the bill. It costs between £750 and £900, and it’s our pick for best mobility scooter in the budget price range. A solid mid-size mobility scooter with a reputation for reliability, the Shoprider Sovereign 4 is a well-constructed and dependable scooter that’s perfect for those who just need some help getting to and from everyday activities.It’s both comfortable and easy to operate, so it’s an ideal alternative for people who have some degree of independent mobility but find walking difficult or exhausting. It can give you back your active life, making simple pleasures like visiting friends, going to the shops, and attending meetings, church services or social events possible once again.The Shoprider Sovereign 4 can be used indoors or out. 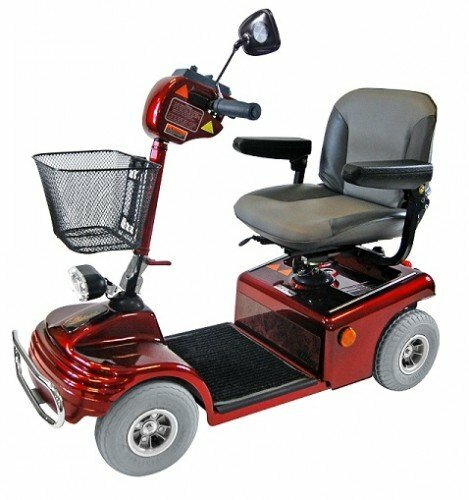 Though it’s primarily designed for use on sidewalks or walkways, its relatively compact size and modest turning radius make it maneuverable in fairly tight spaces and it can easily navigate through a supermarket, airport, or shopping mall. If you’re an experienced mobility scooter user you’ll be impressed by the comfort, convenience and stability of the Shoprider Sovereign 4. And if you’re new to mobility scooters the Sovereign 4 is a great place to start; it’s worry-free and easy to operate, making it an excellent model for first-time users. The Shoprider Sovereign 4’s unique combination of luxury features and affordable price sets it apart. Though it’s very affordable, it delivers the kind of comfort and accessibility you’d expect in a much more expensive model. In addition, the Sovereign 4 is built for safe, secure, and worry-free transport. It has a maximum capacity of 18 stone (115kgs) and a safe climbing angle of 8º with a maximum range of up to 20 miles between battery charges, depending on terrain and operator weight. The Shoprider Sovereign 4 excels at serving the needs of people who simply need help getting to and from everyday activities. Designed for comfort, stability and ease of operation, this is a model that’s appropriate for either new or experienced mobility scooter users. It’s ideal for use on pavements, sidewalks, and wooden walkways and it can also traverse grass and surfaces like gravel or dirt carparks and driveways. The adjustable swivel seat and adjustable tiller make access easy and operation comfortable. Its four-wheel design makes it very stable and its 8 degree safe climbing angle will easily handle most everyday demands with ease. The Shoprider Sovereign 4 is a simple, uncomplicated, and affordable scooter that is designed to be a dependable mobility aide for everyday life. It can take the challenge out of things like shopping, meetings, appointments and social events and make them a pleasure once again. The Shoprider Sovereign 4 is not designed for use on roadways and in fact cannot be legally used on a roadway or street. It is designated as a class 2 pavement scooter and has a maximum speed of 4 mph. While the Sovereign 4 can be disassembled for transport or storage, it is not primarily intended to be a travel or portable scooter. At ebay.co.uk you can purchase Shoprider Sovereign 4 Mobility Scooter, up to 20 miles range, 4mph top speed for only £949.00, which is 25% less than the cost in Amazon.co.uk (£1,270.70). The lowest price of Shoprider Sovereign 4 Mobility Scooter Wheeled Travel Car Basket Captain Seat was obtained on March 28, 2019 12:06 pm. The Shoprider Sovereign 4 is a simple, easy to operate pavement class mobility scooter that provides a lot of comfort at an affordable price.It's an ideal budget-conscious choice for anyone who simply wants help getting to and from everyday events and activities, and it's a good entry point for those who are new to mobility scooters. Overall it's an excellent value, and it's our pick for best low-cost pavement class scooter. You wouldn’t believe what I do and where I go on mine or that the battery is dated as 13 years old this summer. I bought the scooter second hand 3 winters ago. I run it to flat and charge it to full twice or three times over the summer then park it up again over winter. I bought it when the earlier model gave out after much use/abuse, first by my late Mum, then myself. I’m really talking of donkeys’ years of reliable use from a Shoprider Sovereign 4 because the mobility vehicle Mum had before that was a ‘Battricar’, and your local dealer is unlikely to have even heard about those! Yes, I second your top budget choice.